Surface and Interface Research group (Saitoh Group), in collaboration with Theory of Solid State Physics group (Maekawa group), Magnetic Materials group (Takanashi group), Keio University and FDK Corporation, has successfully demonstrated that a spin current can be injected into a Mott insulator and can propagate over a long distance. Furthermore, the group has showed that even an insulator can transmit electric signals via these processes. This has enabled, for the first time, to use spin current in insulator, making a good use of the relativity effect in a solid (spin-Hall effect) and exchange interaction at the interface between a metal and a Mott insulator. It would lead to the developments of new signal transmission devices with low energy dissipation. This work was performed as a part of the Basic Research Programs of Japan Science and Technology Agency (JST). The research achievement was published in the British Science Journal "Nature" on March 11, 2010, and was reported in the top pages of Mainichi Shimbun, Kahoku Shimpo (March 11, 2010), and others. Figure. 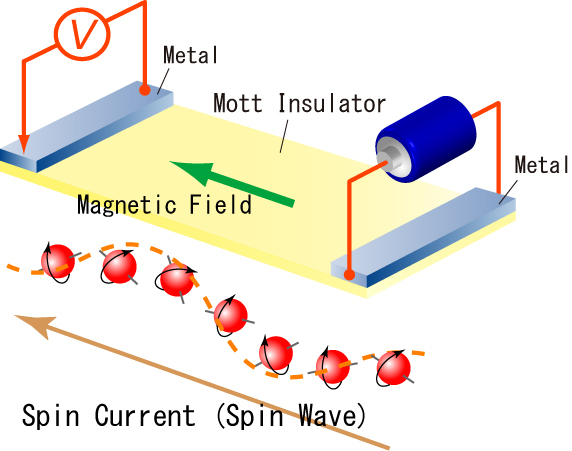 Schematic illustration of a spin current (spin wave) in a Mott insulator.